This FUN event is to raise funds for Johnny’s Magical Musical Tour for Special Needs Children and Orphans around the globe. All proceeds from the event will go towards assisting special kids in 36 countries.The event will be at The Stables Bar and Restaurant in the private function room upstairs. Tickets are 250 AED each include Buffet Lunch and Free Drinks from 1pm-4pm. The toe tapping, finger snapping, hand clapping All Irish Ceili Band BOXTY will get your spirits lifted onto the dance floor! Open Bar after 4pm. 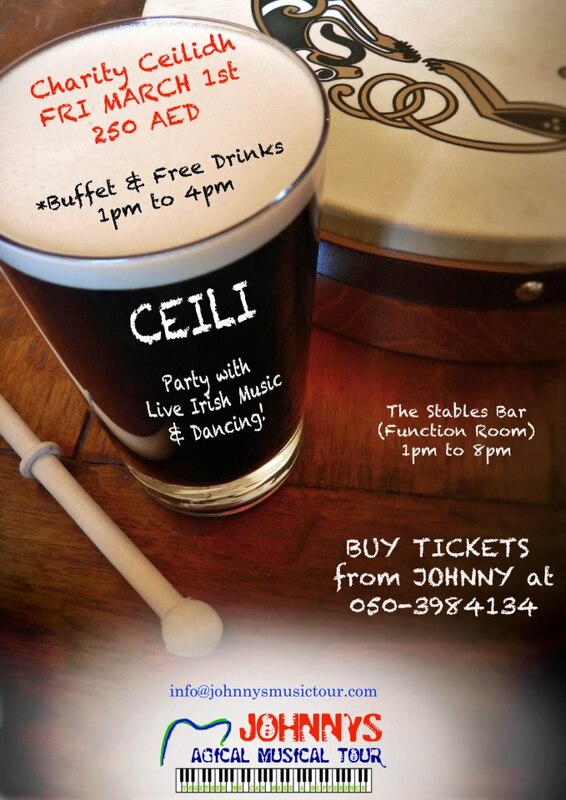 Tickets are available from Johnny on 050 3984134 or e-mail info@johnnysmusictour.com. Please book early to avoid disappointment and to confirm numbers.There will be lots of fun and big surprises so Don’t Miss this great party! !